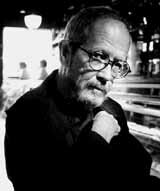 Difference between revisions of "Elmore Leonard"
* Elmore John Leonard Jr. (born October 11, 1925, in New Orleans, Louisiana) is a popular American novelist and screenwriter. * '''Elmore John Leonard Jr.''' (October 11, 1925 - August 20, 2013) was a popular American novelist and screenwriter. * His father worked for General Motors (GM), as a site locator for GM facilities, which caused the family to move frequently. Although Leonard was born in New Orleans, he did not live there for long. The family moved often until he was nine, in 1934, when they settled in Detroit, Michigan. * A number of Leonard's novels have been adapted as films, perhaps most notably Out of Sight, Get Shorty in 1995, and [[Rum Punch by Elmore Leonard|Rum Punch]] as the 1997 film [[Jackie Brown]]. The film Bandits was originally meant to be an adaptation of Elmore Leonard's novel "Bandits", to which Bruce Willis owns the film rights, but the producers felt it was too weak and brought in writer Harley Peyton to write a new script from scratch. * Leonard now lives in Oakland County, Michigan, with his family. * Leonard resided in Oakland County, Michigan.